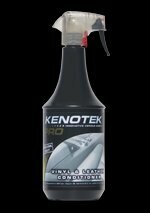 Kenotek Leather & Vinyl Conditioner renews an 'as new' feel to plastics and leather. Its thick yet sprayable formula smells good and is pleasant to use. Spray the product on the surfaces, and distribute evenly. Let it dry. To obtain a matt finish: rub the surfaces with a dry fluff-free cloth or paper. Never use on steering wheel or pedals.